A new range of dosing pumps offering an efficient, reliable and low maintenance solution for applications where low flow, accurate dosing is required. The new Mono dosing pump provides a smooth pumping action with no pulsation and very low shear. 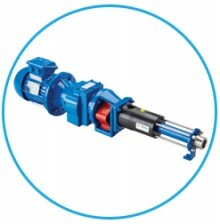 The pump is ideal for either intermittent or continuous dosing duties in high pressure, low flow applications, and represents a cost-effective and reliable alternative to the more expensive gear pumps traditionally used for these types of duties. Manufactured to ISO 9001:2008 quality assurance standards, the modular design of the new dosing pump allows the four models in the range to cover performance requirements from 5 litres per hour up to 1,250 litres per hour and 72 bar pressure.